Allied cross-border raids, August to September 1914. 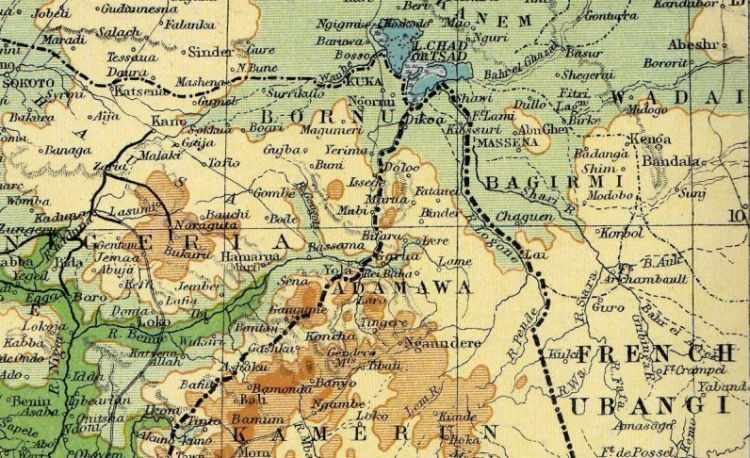 In August 1914 the British possession of Nigeria shared a long land border with German Kamerun running from the Bight of Biafra 1,000 miles northeastwards to Lake Chad. At the Lake the German territory was only about 65 miles wide. To the east Kamerun shared an even longer border with French Equatorial Africa that ran southeastwards down to the Congo River. Marshes had formed adjacent to the Lake but to the south the Kamerun territory was open plain with some mountain features. The two main German garrison posts in the Lake Chad area were at Mora which lay 100 miles south of the Lake in the centre of German territory, and Kusseri on the eastern frontier. One German company was believed to garrison both posts. The company headquarters was at Mora where the Mora Mountain rose 1,600 feet above the plain. The armed forces of Nigeria consisted of the Nigeria Regiment (two batteries each of six 2.95 inch mountain guns, a mounted infantry battalion of three companies with 4 machine guns, and four infantry battalions each up to 1,200 men strong with 8 machine guns per battalion), an armed police force 2,100 men strong, and a Marine Department over 1,000 strong with steamers launches and pinnaces for use along the coast and on the rivers. When war was declared the Nigerian Regiment soldiers, the police and the Marine Department were deployed according to the territory’s Defence Scheme. This envisaged defence against German cross-border raiding parties. British columns of troops were positioned at tactical points along the Kamerun border and the most northern column was at Maidugari where it could react to an enemy raid coming from Mora. Captain R.W. Fox commanding “A” Company 2nd Battalion Nigeria Regiment was ordered to Maidugari where he was joined by “C” Company of the Mounted Infantry. Located in depth behind Fox were two infantry companies at Nafada. The Governor-General of Nigeria, Sir Frederick Lugard, was on leave in Britain in early August 1914 and Mr. A.G. Boyle was acting in his place. Colonel C.H.P. Carter was the Commandant of the Nigeria Regiment and was in Nigeria at his headquarters. He immediately advocated offensive operations involving columns crossing the border to distract the Germans whilst a main thrust seized Douala, the principal Kamerun port and naval base. Boyle obtained an instruction from London forbidding offensive action and he tried to water down Carter’s Defence Scheme deployments, fearing that the removal of troops from western and central Nigeria would lead to internal disturbances. But Carter had his Defence Scheme and he stuck to it, hoping to catch the Germans off-balance in the northern half of Kamerun where enemy communications were reliant on British and French assistance. Boyle reported all Carter’s actions back to London but omitted Carter’s reasoning. The civil administration and the military in Nigeria were missing the direction and unifying authority of the absent Governor-General Lugard. Now the French from their regional headquarters at Dakar in Senegal agreed to co-operate in an attack on Douala on the Kamerun coast and stated their intention of also attacking independently across Kamerun’s eastern border. The French agreed to the attack on Douala being commanded by the Inspector General of the West African Frontier Force (WAFF) Brigadier C.M Dobell. The WAFF not only contained the Nigeria Regiment but also a Gambian infantry company, a Sierra Leone infantry battalion and a Gold Coast mountain artillery battery and infantry regiment. General Dobell was in the UK organising the concentration of the WAFF and Imperial units from Sierra Leone that he needed, and planning the Allied operation against Douala in consultation with the Royal Navy. Dobell did not want separate operations elsewhere in Kamerun dissipating his forces. However both Carter and Boyle agreed that it would be politically and militarily advantageous to have northern Kamerun under Allied control before the move on Douala started. Since being deployed to Madugurai Fox had entrenched himself near the German border and collected information on enemy movements and activities. With Carter’s agreement the mounted infantry company had been reconnoitering towards Mora. The German commander at Mora was Captain von Raben who occupied a small brick-built fort with his 3rd Company. This fort was located on the plain one mile east of Mora town. The German telegraphic links to Douala had been halted on the borders by the British and French since 31st July, and although von Raben did not know of the declaration of war French military movements made him assume that it had happened. He had with him eight Germans and 60 local troops with two machine guns whilst at Kusseri Fort he had Lieutenant Kallmeyer, one German and 35 local troops with another machine gun. 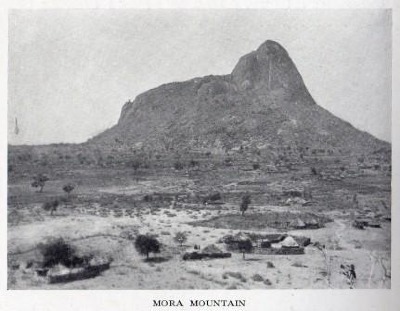 South of Mora at Marua was a detachment of the 7th Company that was headquartered at Garua, which lay 125 miles to the southwest near the Nigerian border. Although they were not his troops von Raben ordered the two Germans at Marua to report to Mora with their 34 local troops and machine gun. Von Raben was an enterprising commander and he engaged 60 recruits to augment his garrison and then entrenched a new defensive position on a prominent ridge 1,300 feet up the steep-sided Mora Mountain. Reserves of food and ammunition were stockpiled here and springs of water were adjacent. On 19th August German sentries saw British mounted troops approaching and von Raben led a detachment of his men out and drove back the British mounted infantry patrol. However the appearance of the British caused the local carriers employed by the Germans to desert. Von Raben now guessed that a British attack was imminent so he partly demolished his fort on the plain and took all his men up Mora Mountain to their trenches. 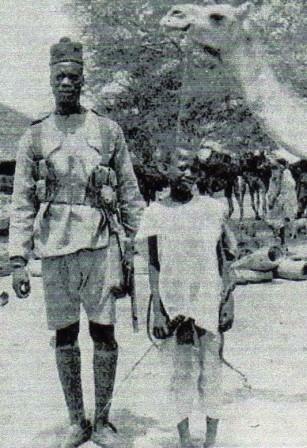 On 20th August 1914 London gave Carter discretion to deal with enemy posts near Lake Chad as he saw fit. Carter immediately signaled Fox at Madugurai instructing him to attack and capture Mora if he considered that his force was adequate for the task. Fox marched quickly and on 26th August occupied a position at Sava which was about 4,000 yards southeast of von Raben’s position. Here the British were joined by Captain Ferrandi and 15 Tirailleurs Senegalaise (French colonial infantry) who had come to advise Fox that the French would be invading northern Kamerun during September. Fox immediately incorporated Ferrandi and his men in the forthcoming British attack. Fox had observed that he could climb higher up Mora Mountain than the German trenches, and so on 27th August he left a mounted infantry detachment with a machine gun to guard his Sava position whilst he and his other men and the French troops climbed the steep mountain. Two local men guided the Allies in darkness to the very top of Mora Mountain. As dawn broke Fox saw the enemy trenches below him and opened fire. However the range was 1,500 yards and the one British machine gun was outclassed by the two that von Raben’s men were firing back. The No 1 on each of the enemy guns was a well-trained German European, as was the German practice in Africa, and their skills ensured that the Allies could not move down the open ridge line that separated the two parties. Fox realized that he could neither close with the enemy nor sustain his men with ammunition and food whilst he was on top of the mountain, so he decided to withdraw to Sava. Then thick mist descended causing confusion amongst three of the withdrawing Allied groups. The machine gun crew under Sergeant Studley, doubtless looking for a satisfactory way down the very steep slopes, wandered too far north in the mist followed by the medical group under Dr. T.P. Fraser and this was in turn followed by the reserve ammunition group under Sergeant Taylor. As the mist cleared these men saw troops in red fezes approaching them. At first fire was opened but as the French troops also wore red fezes the order was given to stop firing. This was a mistake as the soldiers were German and had been dispatched by von Raben to counter-attack the Allied position. This enemy party rushed the British, capturing Studley’s machine gun before it could come into action and killing Dr. Fraser, two soldiers and five gun carriers. Studley and some of the men escaped but Taylor, a soldier, the gun and twelve boxes of ammunition were captured, along with some stores. Von Raben, although having 50 less men than the Allies and a large number of untrained recruits in his less-elevated position, had exercised a tactical superiority over Fox. The Allies built a defensive position on a rocky hillock near Sava and Fox requested that some artillery be sent to support him before he moved against the enemy again. On 2nd September Ferrandi and his Tirailleurs returned to French territory. Meanwhile von Raben now positioned a post on the higher ground that the Allies had briefly occupied on Mora Mountain. In late August Lieutenant Kallmeyer and his 36 men inflicted heavy casualties on a French detachment from Fort Lamy of 250 riflemen with one old gun that attacked the Kusseri Fort. Kallmeyer had surrounded the fort with a thick abattis (deep fence obstacle) of thorn bushes, and skillful machine gunnery prevented the French from penetrating this and rushing the fort. The old gun was soon put out of action and after suffering 5 French and 18 Tirailleur casualties the French also withdrew and requested reinforcements. These arrived on 20th September but Kallmeyer fought a successful withdrawal action to Mora, although he lost about half of his men. 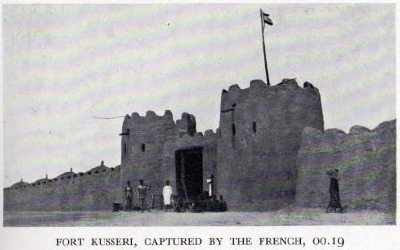 Fort Foureau became the new French name for the captured Kusseri Fort. 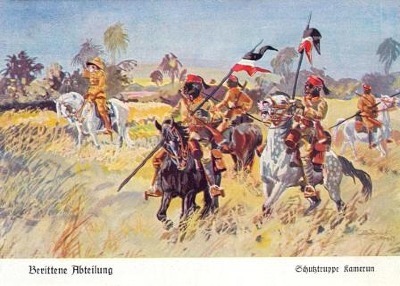 Von Raben held Mora until the bitter end, only surrendering on 18th February 1916 when the remainder of the German forces in Kamerun had sought refuge across the southwestern border in neutral Spanish Rio Muni. What the early Allied cross-border raids in northern Kamerun had shown was that whilst the British and French were trained and equipped for actions against dissident tribesmen, the Germans had equipped and prepared for more serious battlefields. Official History, Military Operations, Togoland & The Cameroons 1914 - 1916. by Brigadier General F.J. Moberley. The Great War in West Africa by Brigadier General E. Howard Gorges. The Empire At War by Sir Charles Lucas KCB KCMG. The History of The Royal West African Frontier Force by Haywood and Clark.